Although I had suspected for some time using the terms Google Adwords Qualified Individual and Google Adwords Professional in my business listing description field might have been problematic, Google never pointed me or anyone else for that matter to a list of terms they automatically reject. I have removed Google from my business description and resubmitted my listing. It now appears my listing has been automatically approved after resubmitting. 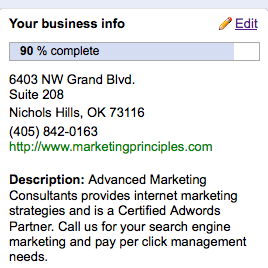 However, the “Your Business Info” section of my Google Places listing still shows my listing is only 90% complete. I guess my Google Places listing will always be a work in progress. This entry was posted on October 27, 2010 at 4:30 pm and is filed under Google Adwords, Google Places Policy Of Allowed Terms, Local Business Center, Qualified Individual, This Listing Does Not Comply With Our Policy of Allowed Terms. You can follow any responses to this entry through the RSS 2.0 feed. You can leave a response, or trackback from your own site.